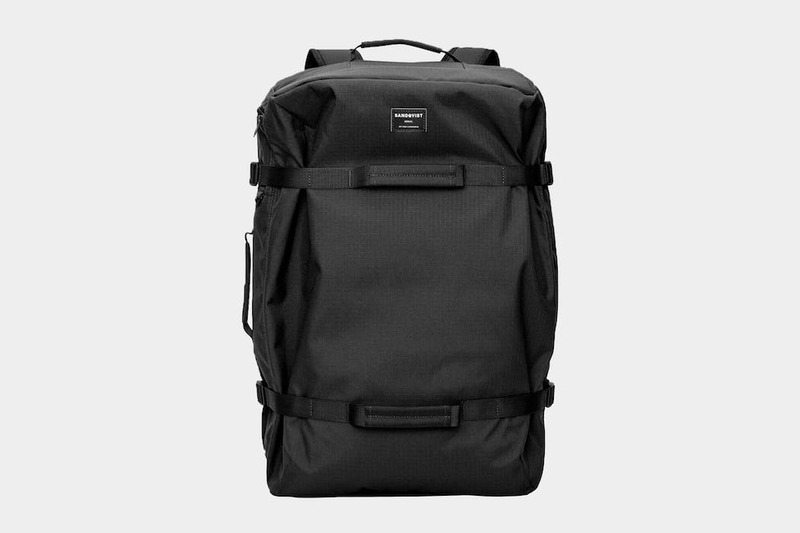 Categorized as a weekend bag by Sandqvist, the 41L Zack seems to check all the travel pack boxes. But can it compete with the one bag travel heavy hitters? 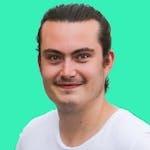 If your surname is as awesome sounding as ‘Sandqvist,’ you’re probably going to name your company after it. And that is precisely what Anton Sandqvist did when he founded his fashionable bag brand in Stockholm, Sweden in 2004. Well, we are proud to announce that they have done exactly this with the Zack backpack! Though categorized as a weekend bag by Sandqvist themselves, this bag seems to check all the “travel pack” boxes. 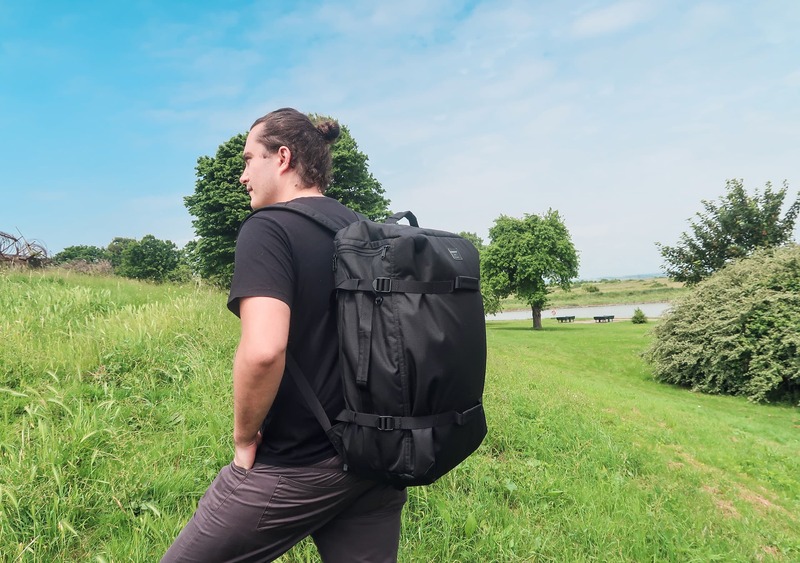 Has this more fashion-focused brand made a bag that can compete with the one bag travel heavy hitters like Minaal, Aer, Tortuga and Goruck? We’re excited to find out! Opinions on aesthetic can vary significantly from person to person, but we’re not going to beat around the bush here, this bag looks great. We love the style and overall look—it’s exactly what you’d expect from a brand that takes its inspiration from Nordic landscapes and urban city lifestyle. The Sandqvist Zack is available in two colors—the black that we’ve been testing, and beluga. They’re very similar; the beluga is just a tad lighter with what seems to be a slight dark green tin. You can’t go wrong with either. With dimensions of 20.5” (52cm) in height, 14” (35cm) in width and 9” (23cm) in depth, this pack is a beast—squeezing just under maximum carry-on dimensions. 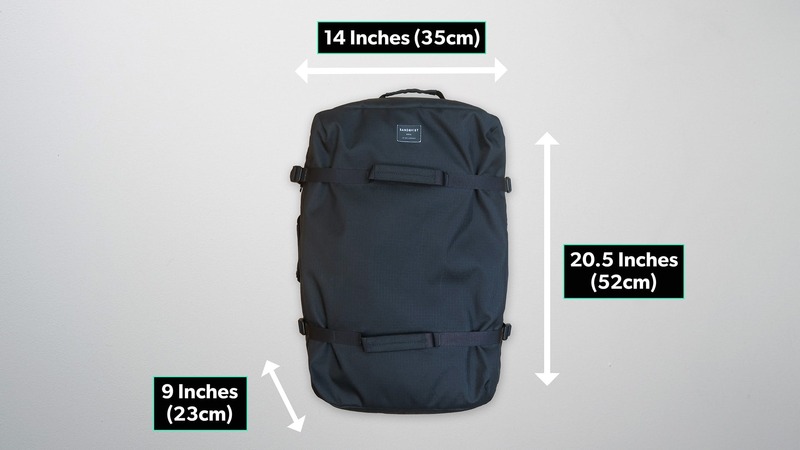 We even feel like the quoted 41L is a bit stingy—for reference, this pack feels a lot closer to the GORUCK GR3 (45L) as opposed to the GR2 (40L). 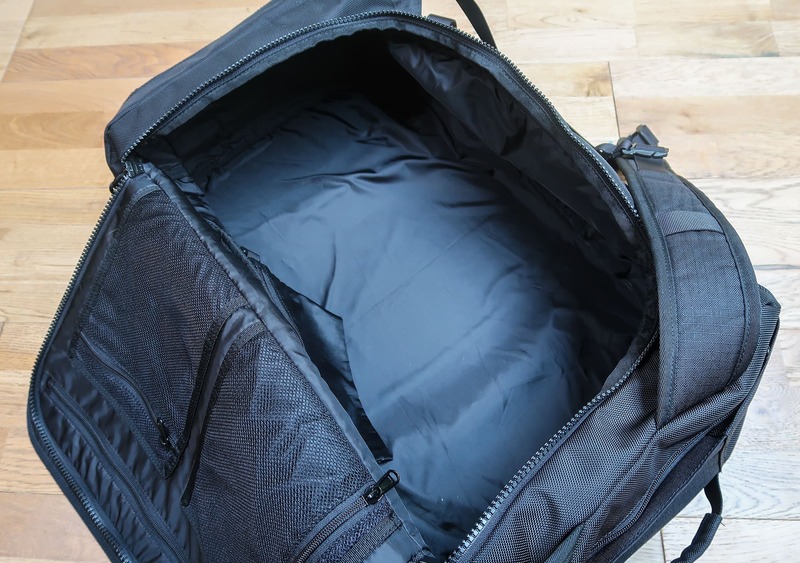 The Zack is also available in a smaller 26L, which you could probably get away with for weekend getaways, but it’s a bit too small for one bag travel in general. The Sandqvist Zack is rocking not one, but two highly durable fabrics. 1680D Ballistic Polyester around the corners and back of the pack, and Cordura EcoMade Polyester Ripstop on the front and sides. To put it simply, this bag is made of some of the most durable, versatile, and reliable materials out there. It is built to last, and the combination of these two materials only help improve the beautiful aesthetic it has going on. 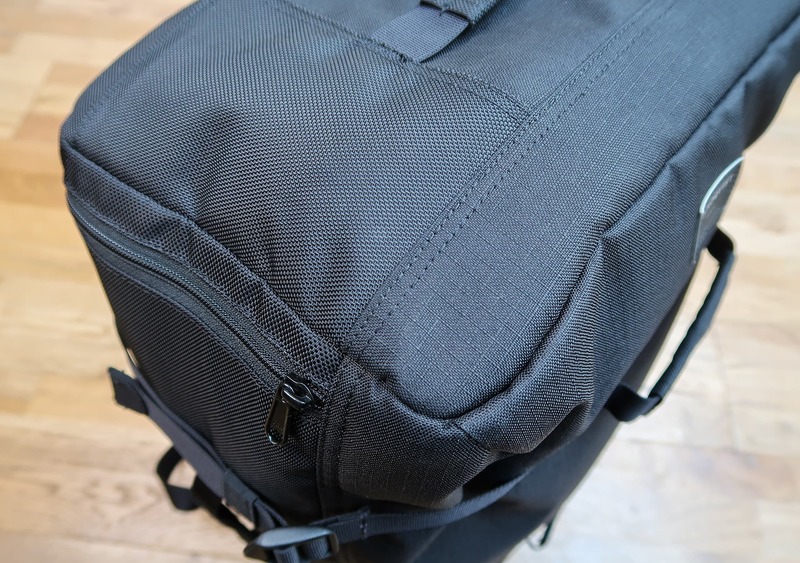 The pack also weighs in at an impressively light 1.85lbs (0.85kg), and is one of the lightest 40L+ backpacks we’ve reviewed. One of the first things you’ll notice on the outside of this pack is all the handles. There’s five in total—two on the front, one on the bottom, one on the top, and one on the left-hand side. They’re super sturdy and slightly padded, with impeccable stitching, so whichever way you want to pick this bag up, you’re not going to have any problems. 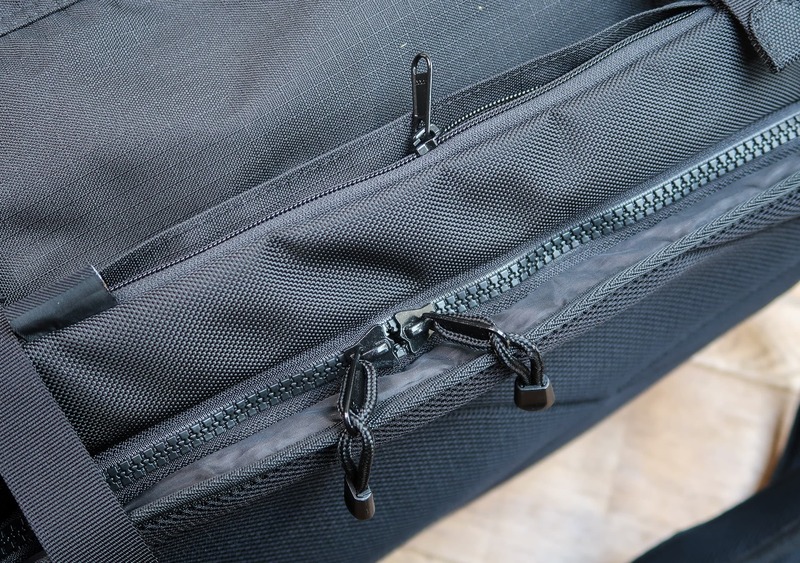 You’ll find two compression straps on both sides of this bag, and these allow you to compress everything down, which is essential, considering the size of this pack. The compression straps don’t interfere with any pockets and zips (we love this) and feature a nice elastic keeper—meaning you don’t have straps dangling all over the place, which we also love. The compression straps can also help with securing larger items you may have in the side pocket. 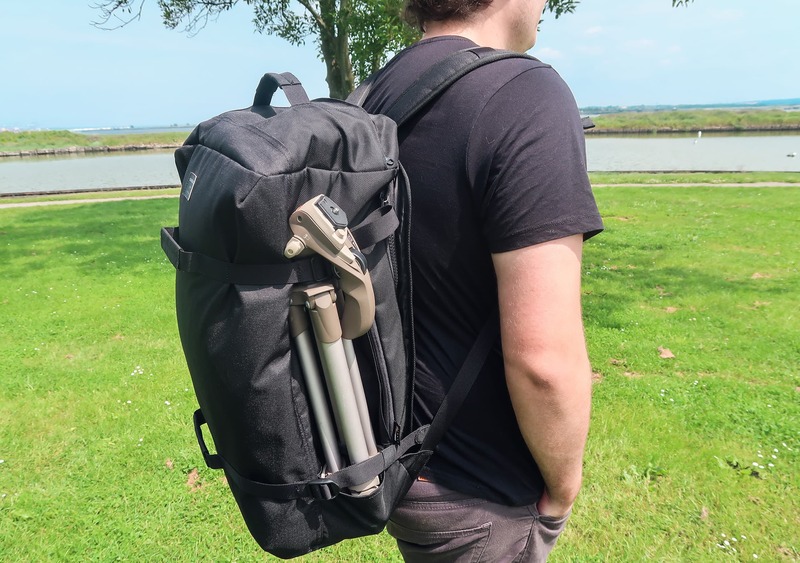 This setup works well with a tripod, slipping the feet into the side pocket and securing the top of the tripod with the compression straps—unfortunately, this is where the usefulness of the side pocket runs out. Side pockets are traditionally used as a place to pop a water bottle in, but the size of this pocket is a bit too wide and short—it’s just an odd shape and bottles will likely fall out, even if you try securing the compression strap over the top of the water bottle too. Sandqvist refers to this pack as a backpack AND a duffel. While it’s true you can use this thing as a duffel—holding the shoulder straps together—it’s not something we do often. 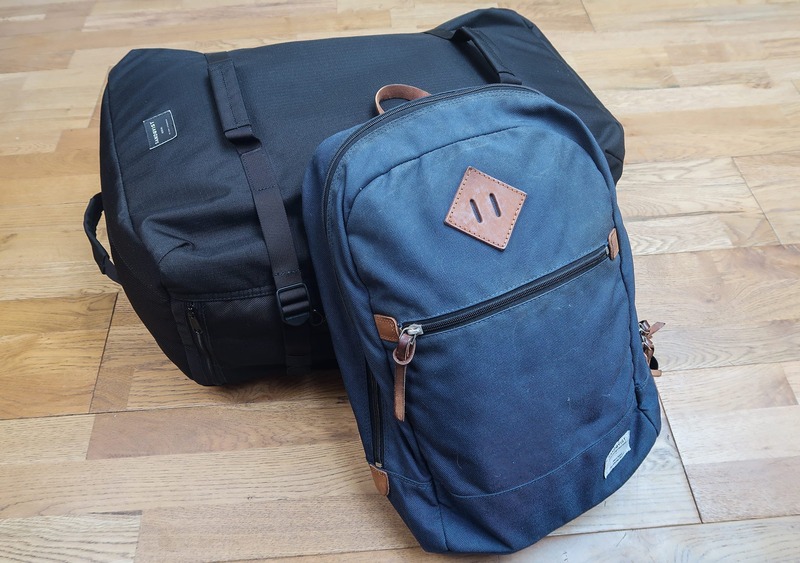 If you’re in a rush and running for a train—or just have a lighter load in general—then the duffel carry style can work quite well, but for the most part we recommend carrying this backpack on your back. 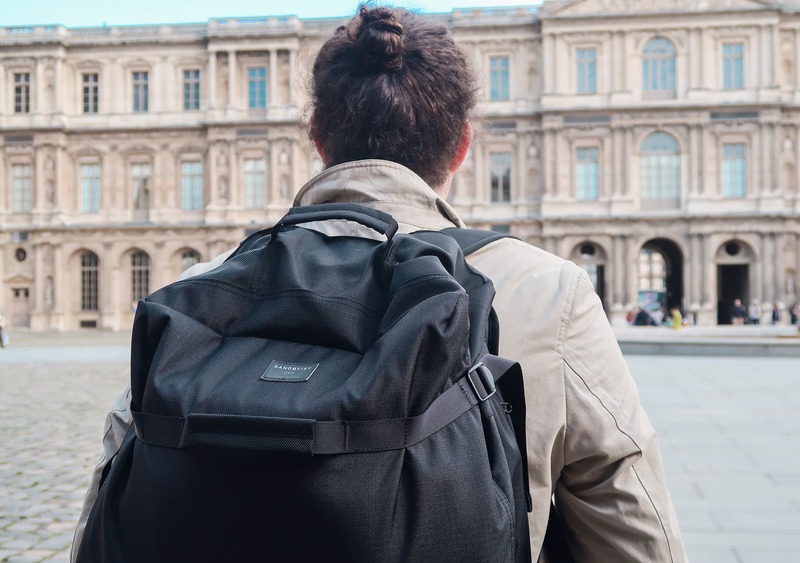 Hence, “backpack.” Nevertheless, it’s cool to have the option, and along with the five handles, it’s another way to grab this bag if you’re on the move quickly. 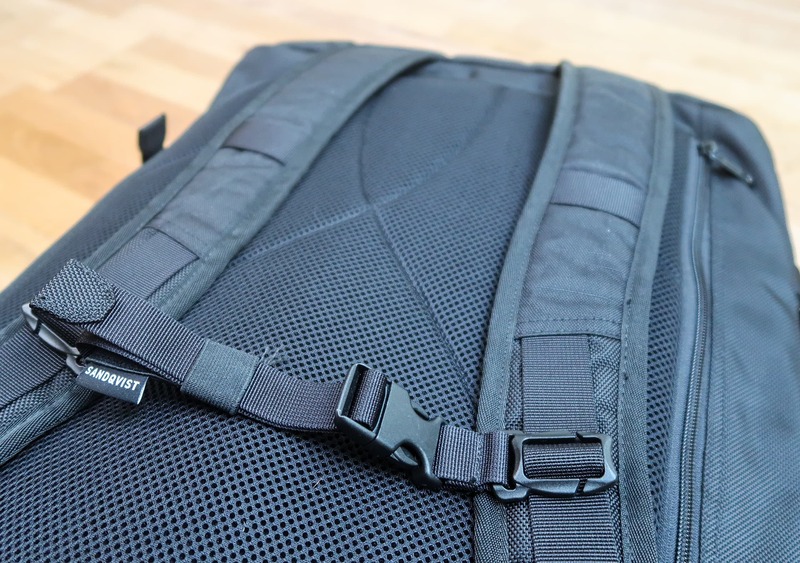 The shoulder straps are very well padded—along with the back too—and provide a surprisingly comfortable carry for such a large pack. There’s even an adjustable sternum strap that locks in securely and fits nicely across your chest. Earlier on, we mentioned how this bag checks a lot of ‘travel pack’ boxes. While this is true, there’s a few boxes it doesn’t check. There is no hip belt, load lifter straps, or frame sheet. Now, not every travel backpack needs all of these things—but for a bag this size and considering the amount it can stick out from your back, we feel they would be useful additions. At this point it’s important to note (again) that Sandqvist sells this bag as a ‘weekend bag,’ not a travel backpack, so you can see why they’ve made these omissions. Every zip on the Sandqvist Zack is YKK, and there are even a few different sizes going on. The main enclosure is zipped up with a big, chunky YKK 8vs; the laptop compartment is YKK 8rcz; and everything else is a nice YKK 5rcz. The zips on this pack are built to last, and the bigger compartments have the bigger zips—it all makes sense. Looking at this pack from the front you may be mistaken in thinking there’s no quick access pocket, well, there’s actually three! Like the main opening—we’ll get to that one in a bit—all three openings are on the back of the pack, which is a great security feature, and we like the way they’ve done this. First up we have a pocket along the top of the pack. You’re going to find yourself using this as your main quick access pocket. It’s great for passports, headphones—anything you need to grab in a hurry. 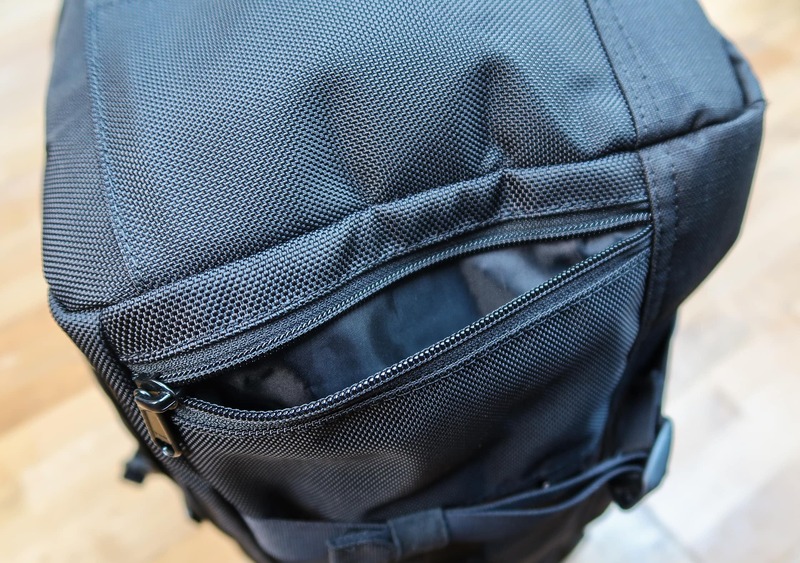 This pocket is surprisingly large, stretching across the entire width of the pack—you can fit a load of stuff in here, even if the main compartment is filled to the brim. The second quick access pocket can be found along the right-hand side of the bag, and this one is also pretty big. We found ourselves using the top pocket more, but these two are pretty interchangeable—whatever suits you. The third pocket is one we didn’t notice straight away, and it’s located on the top left corner of the bag. This one is a good bit smaller than the others and comes in surprisingly handy. It’s perfect for smaller items that tend to get lost in larger pockets, like earphones, packs of gum, and even coins you collect while traveling. Before we get into the main compartment, let’s take a look at where you’re going to put your laptop—which, funnily enough, is located in the back panel opening of the main compartment. We thought this placement was odd at first, but it actually works really well. 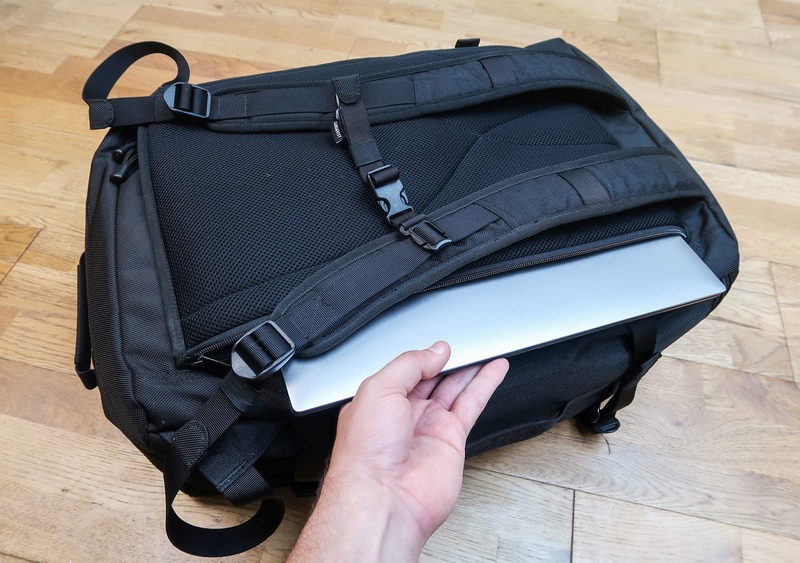 Having the laptop compartment located here means you can grab it quickly whenever needed—without rifling through your bag—and it also acts as a sort of pseudo frame sheet, but don’t worry, there’s plenty of padding between your laptop and your back too. The size of the compartment is pretty great as well, it will fit a 15” laptop with a protective sleeve comfortably. We have found this to be absolutely perfect for any and all of our laptop needs. Now back to the real world where bags can’t talk, we’ll take a quick look at the internal pockets. 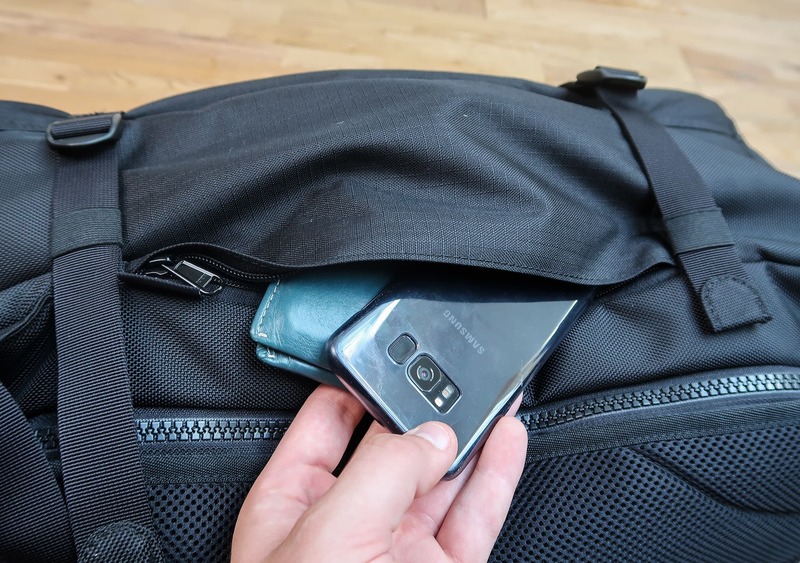 Within the main compartment, you’ll find a medium-sized pocket attached to the side, which is great for smaller items that would otherwise get lost inside the main compartment—we didn’t find ourselves using it too often, but it’s a nice addition. On the back of the panel opening, you’ll find three more pockets for some added internal organization. There’s a long zip that will give you access to a large, thin pocket which is great for documents. 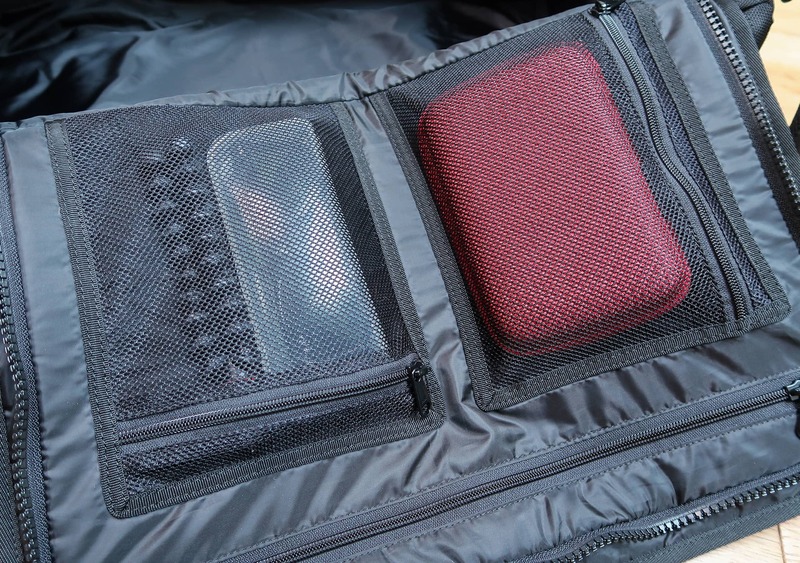 The final two interior pockets are both mesh and come in useful, we’ve found them to be ideal for an external hard drive case—but they’ll work well for any items you need some added organization for. In our six weeks of testing to date, this pack has really traveled. The Sandqvist Zack has been on trains, buses and long-haul flights—including trips to the UK, France, Spain, Germany, and the USA. We’ve really put this thing to the test—it’s been filled to the brim with some seriously heavy gear at times—and its durability has shone through. This is a bag that is built to last. The Sandqvist Zack is going to look great in an urban city environment—it looked seriously good while strolling around Paris in the spring—and function flawlessly for your weekend trips. But with no hip belt, no load lifters, and a shape that can cause some ‘sag’ at the bottom, there are some drawbacks. You can carry this bag when it’s really heavy, but it’s not ideal. If you’re looking for a pack that is going to accompany you on a year-long trip to south-east Asia, this probably isn’t the bag for you. 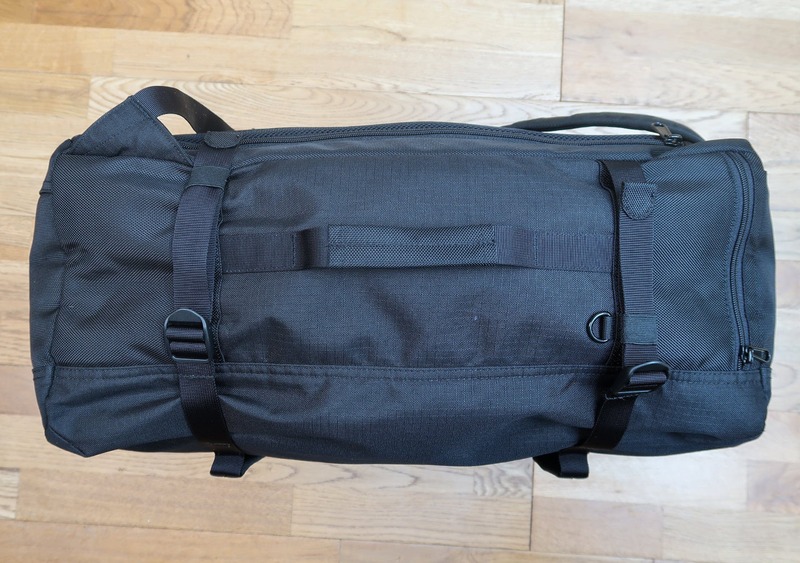 That being said, if you’re in the market for a maximum legal carry on sized pack that you want to stuff some lighter-weight items in—think big winter jacket for when you’re exploring Sweden or Canada—then you should seriously consider the Sandqvist Zack. Love the feel of this pack, it’s made very well, and very aesthetically pleasing. It’s holding up very well, even after some pretty full on testing, no signs of wear. The Sandqvist Zack, though sold as a weekend bag, works well as a travel pack and looks fabulous while doing it. The bag has been designed thoughtfully with great features, and has been put together using durable materials that we trust will stand the test of time. 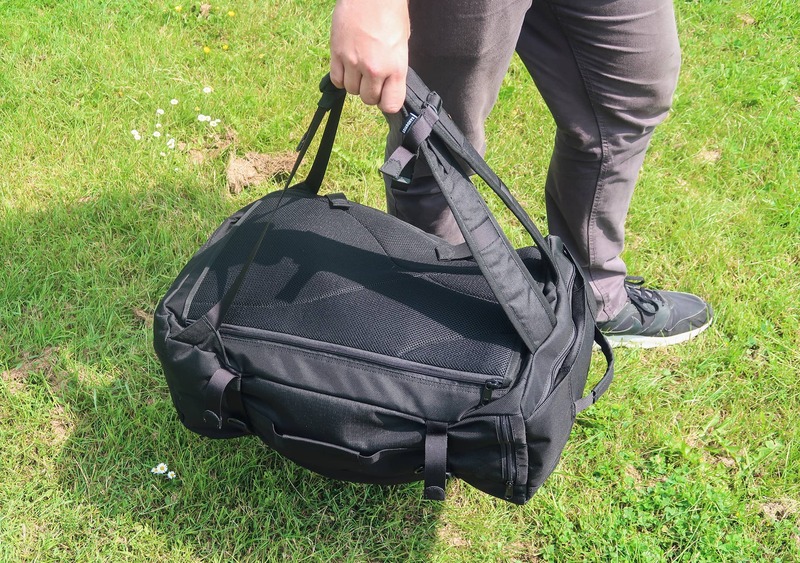 With the lack of hip belt and load lifters, this bag isn’t ideal for heavier weights, but if you need a ton of room and have a lighter load, this is a great option.